FeastHome – Farmhouse kitchens are one more thing that is currently in trend. The goal is to make your kitchen look like a medieval age rustic kitchen in a country house with modern equipment. There are certain things that make a farmhouse kitchen what it is. We are here to introduce you to the trend that a lot of people are talking about. It has a warm and neutral feel to it, which is what most of the people want. It doesn’t try to make any bold statements and expect you to make daring choices. 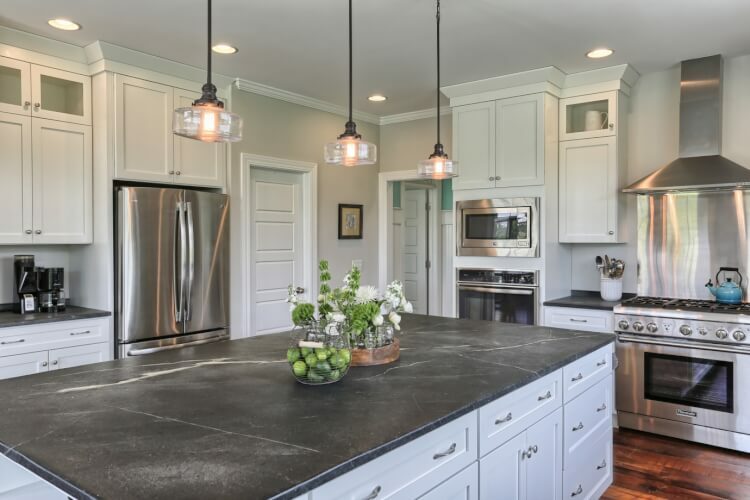 It is the best option if you don’t want to make daringchoices but still want to have a trendy kitchen.This is what a typical farmhouse kitchen looks like. What makes a farmhouse kitchen a farmhouse kitchen? A lot of things are characteristic of a farmhouse kitchen. We have listed some of them below. Have a look at them. Hardwood Floors: Hardwood floors are a must for a farmhouse kitchen. They have a feel of country and a touch of vintage to them. You can buy real hardwood or laminates that have hardwood design on them. The choice is yours. 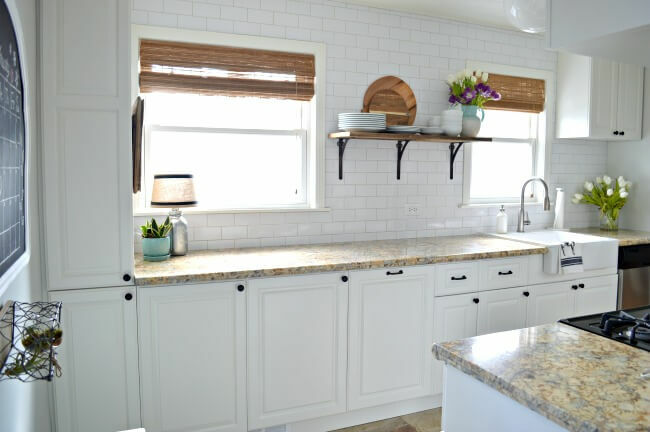 White cabinets: White open cabinets are another key ingredient of a farmhouse kitchen. You have to be clean with your placing and careful with the utensils. Just white open cabinets and hardwood floors are what primarily make a farmhouse kitchen a farmhouse kitchen. White cups and plates: These are just to add to the depth of the look of the kitchen. Colourful kitchenware does not look good in a farmhouse kitchen. The colours that are quite acceptable are ivory and pale gold. Brown window frames: Brown window frames match with the hardwood on the floor. This also contrasts with the white cabinetry and gives a royal look. Imagine these things in your mind. Don’t they all come together? A farmhouse style sink: Also known as an apron-front sink, this will help you achieve the look with perfection, top-to-bottom. 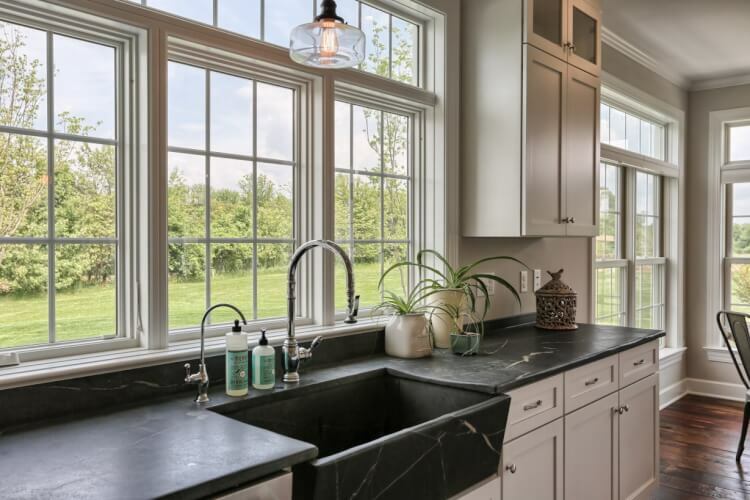 They are not here just for the look, and the apron-front sink has so many advantages. It is deeper and bigger than a traditional sink, and it extends outside the counter, so you don’t have to lean in and wash your dishes anymore. Once you have finished this, the kitchen should already look like a farmhouse kitchen. But, if you aren’t settlers, and want to nail the look perfectly, here are some accessories that you can add to your farmhouse kitchen. 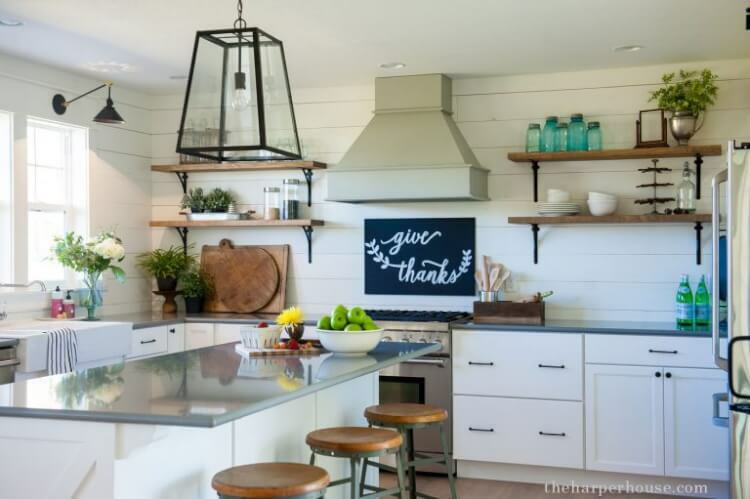 Okay, you have decorated a kitchen that looks like a farmhouse kitchen. Want to make it feel like one? Don’t go anywhere; we have got the answers for your needs. Flowers: Make it a habit to refill your kitchen with fresh flowers every now and then. Flowers provide fragrance and are a great presence in the kitchen. It increases the wow factor of your kitchen. Textures: Do not invest in boring dry paint. Invest in wallpapers that liven up your kitchen. You can go with eggshell wallpapers that have a touch of brown. This will give a lived-in vibe to your new kitchen. Mason Jars: Long before plastic kitchenware were a thing, people used mason jars to store their ingredients. Buy a set of mason jars and use them to store your ingredients. They are completely usable. Apron Rack: Yes, an apron rack in the kitchen will take you back right to the 70’s. Throw a couple of old, worn 80s designer aprons on them and you have perfected it. Curtains: Use simple checked curtains to cover windows. A modern curtain might be eye-catching, but it would not be compatible with the look you are going for. Stoneware: Buy small jars or pots made of stone. Years ago people used stone cookware for pretty much everything. It is not toxic and the flavours are richer than compared to the flavours you get from your normal pans. They are highly durable and last as long as you take good care of them. Use oil to create a non-stick layer. These are just some of the many things you can do to make a farmhouse kitchen. If you are feeling this isn’t enough, you can buy an antique bicycle and showcase it in the kitchen. You can add a ladder and some ploughing tools and keep them on one side. You can use antique clocks, or weighing scales. You can opt for brick finished walls. The options are limitless. The only factors are the size of your kitchen and how much you want to spend. If you feel you cannot picture a farmhouse kitchen with the ideas above, take a trip to your relatives’ house in the countryside. Have a look at their kitchen. Ideas will spring into your mind. The farmhouse kitchen style is in trend for one reason: to pay respect to the way our ancestors lived and flourished.